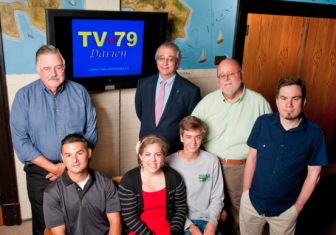 Darien TV79 has a new, improved look thanks to a generous donation from the Darien Foundation. The Darien Foundation’s $25,000 grant was used this summer to install new high-definition TV cameras and switching equipment for TV79’s airing of meetings in Room 206 of Town Hall. The grant also covered the cost of new wiring, monitors and associated gear in a project that lasted several months, though meeting coverage continued without interruption. “We are so pleased to be able to support the continuing work of Darien TV79 in bringing Town government to Darien residents,” said Darien Foundation Executive Director Sarah Woodberry. “Darien has much to be proud of in the transparency of its government thanks to Darien TV79’s efforts and The Darien Foundation is happy to contribute to the operation”. “We are so grateful to The Darien Foundation for funding this project,” said Jim Cameron, co-founder and Program Director of Darien TV79. David Dever, the station’s General Manager and co-founder noted that the new tech replaces old cameras that have been in operation for 11 years. Funded by grants from Altice (and before that, Cablevision) cable subscribers and town funds, Darien TV79 broadcasts all town board and commission meetings, either live or on tape delay, and archives all of these proceedings on a Vimeo channel for on-demand access. Over the summer Darien TV79 just uploaded its 1000th program to Vimeo. Darien TV79 also offers a live internet stream in prime time so residents can watch meetings anywhere in the world. The Darien Foundation’s reputation for thoroughly researching grant requests and carefully administering grant awards has earned the confidence of its donors. 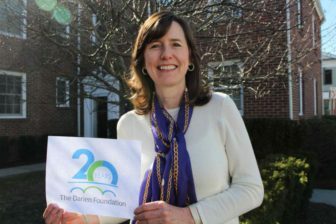 This dynamic, community minded foundation in marking 20 years of supporting projects that enhance Darien. The Darien Nature Center will be getting a major upgrade to its Animal Exhibit Room, thanks to a $50,000 grant from the Darien Foundation. The Nature Center says it will create a New England Forest and Pond Ecosystem exhibit that will showcase native turtle species in their habitat along with other pond wildlife.